8 Effective Ways to Promote Your Business on Facebook | WAZILE Inc.
As of this year, 2018, there are 2.23 billion monthly active users worldwide. Here in the Philippines, it is expected that the users will reach 36.2 million. Facebook is one of the most used social media platform around the world and is best platforms to help promote your business. It is also one of the famous social media marketing platform that business owners use. Facebook is one of the best places to promote local, small, medium or large, with an effective strategy, it is easy to promote your business on Facebook. According to a study by one if the biggest telecommunications company in the Philippines, as of 2016, Filipinos spend 3.2 hours on mobile and 5.2 hours using other devices such as desktops, tablets. And most of this time is being spent scrolling through Facebook. With today’s advancements in technology, Facebook has launched the Marketplace in 2016 wherein users can easily buy and sell services and products. Not just that, Facebook has different options for businesses, you can have your offers advertised, you have automated-reply options for chats, you can post your services and more. Whether you are just new in promoting your business on Facebook or continuously improving your strategies, we have listed some effective ways to help promote your business on Facebook. It is easier to sell your business when you have a target audience in mind. Identifying your target audience can help your business develop effective marketing strategies. You can customize your posts for boosting to your target market when It comes to boosting your posts too. Catch your reader’s eye with a brief yet captivating text about your product, how they can benefit from it and what are the features your product or service has. Be concise as paragraphs tend to scare readers away. You have probably noticed that Facebook is showing how fast your page responds to user chats. Answer user inquiries in your message box or even in your comment box. Show your users that you care and value their thoughts on your business. Engagement builds connection between your brand and audience. Facebook consumes almost 8 billion videos a day, that is more than the population of the entire mankind. Some users prefer product videos as they can see and review the products straight from the video itself without leaving their home. Everything begins with a content strategy. What are your goals? Do you have campaigns? What’s the next step for this business? What are we going to share to people? Do you have new products? This can help your business reach its goals easily. With an effective content strategy, your business can thrive and become known to people that uses Facebook. Free stuff? Giveaways? People love that. The bigger the price, the more users will be engaged to your post. This comes as a type of strategy to attract users to check on your website. People tend to give more attention to posts when they gain something from it. What more can be the easiest way to promote your business on Facebook is through Facebook ads itself. This may also merely depend on your budget, although even just a little boost can go a long way. Facebook marketing isn’t really that hard. 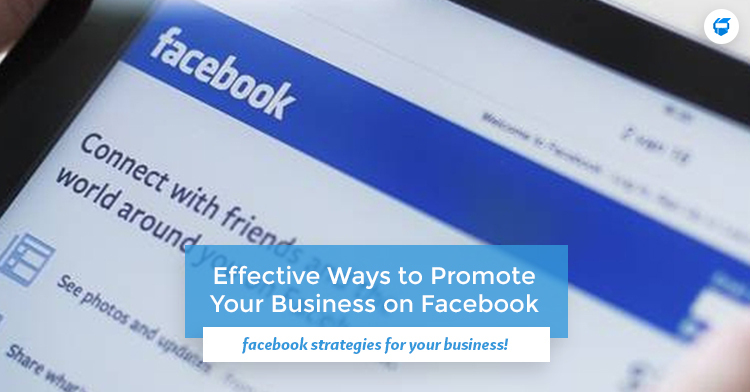 As long as you have a strategy to work on, it will be easy for you to promote your business on Facebook. 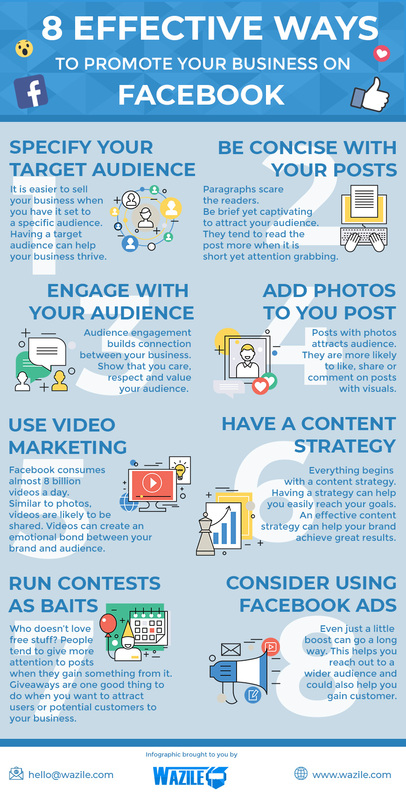 Check out our infographic for briefer yet comprehensive details on effective ways to promote your business on Facebook. Are you looking for a digital agency with that can help you with your business’ social media marketing? Talk to us and let us start collaborating!